It was a busy valentine’s days for volunteer firefighters at Mt Eliza Fire Bridge. Shortly after 9:00am, Mt Eliza Fire Brigade was requested to assist Frankston at the top of Oliver’s Hill on Nepean Highway. An Asbestos roof from a shed and flown off, landing across all four lanes. 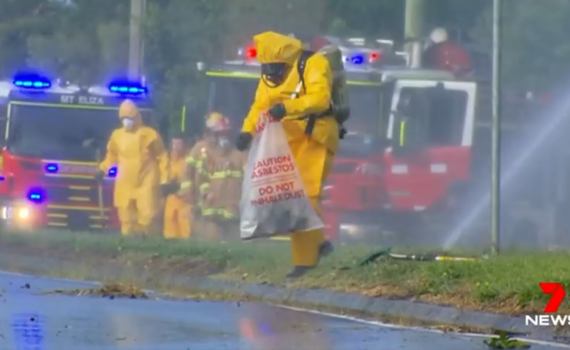 On arrival of the Frankston crew, the highway was immediately closed in both directions and the Asbestos was wet down to reduce airborne fibres. A community warning was also issued to inform nearby residents stay indoors and turn off air conditioners. On route, our fire truck was flagged down by a vehicle stopped in the right-hand lane, 200 metres north of Canadian Bay road alerting us to a low hanging power line in which the fire truck would have hit. We promptly got onto dispatch to organise our second truck to assist, along with the power company to remove the line. Once we arrived at Oliver’s Hill, we sent two crews wearing breathing apparatus and chemical splash suits to clean up the Asbestos. Crews were on scene until 11:45am for both jobs. In the afternoon, our tanker crews continued working until 10pm over two shifts, assisting the SES with storm damage. In total, we responded to about 10 jobs entailing branches fallen on houses, cars and blown over fences. Mt Eliza Fire Bridge would like to thank the partners of our volunteers giving up their time to assist the community when required.